Island four is a little closer to shore, just behind the biggest island in the chain, Koh Poda. Nice plate and staghorn formations here as it is a little more sheltered. 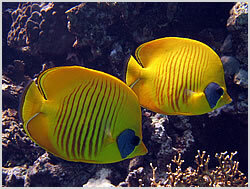 Good fringing reef and abundant butterfly and angel fishes.